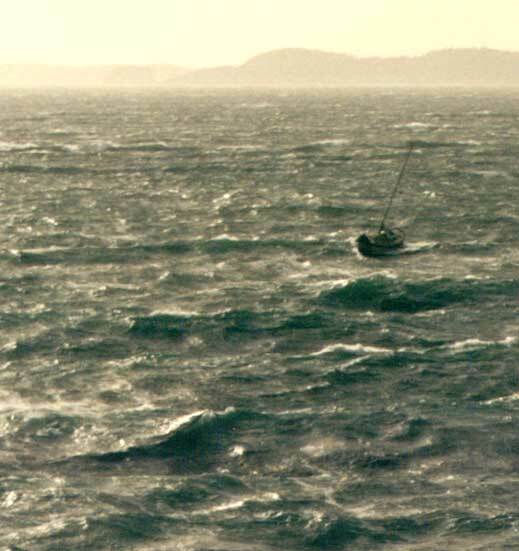 The west wind was blowing a full gale this day, barrelling down the Strait of Juan de Fuca. This Canadian sloop has just turned eastward and is aiming for the entrance to Deception Pass, hoping to gain the sheltered waters of Cornet Bay. The tide was turning and in a few moments more would be rushing out through the narrow pass, piling up massive, breaking waves in resistance to the gale. Fortunately, this skipper shot through the opening moments before that happened, and he settled in for a peaceful night at anchor in a safe refuge.